Why is it so hard to put things together, but so easy to pull them apart? Why is it so hard to do the right thing, but so easy to go down the wrong path? Why is it so hard to put your all into something, but so easy to just give up? Why is it so easy to pretend like we didn’t see anything, and so hard to speak out and make a change? With our books talking about young girls going through big changes as they are growing up but with completely different stories, we came up with the common theme of femininity. In one of the stories, Along for the Ride, it is about a girl who moves away to live with her dad and she goes through the change of finishing her growing up in a new environment. 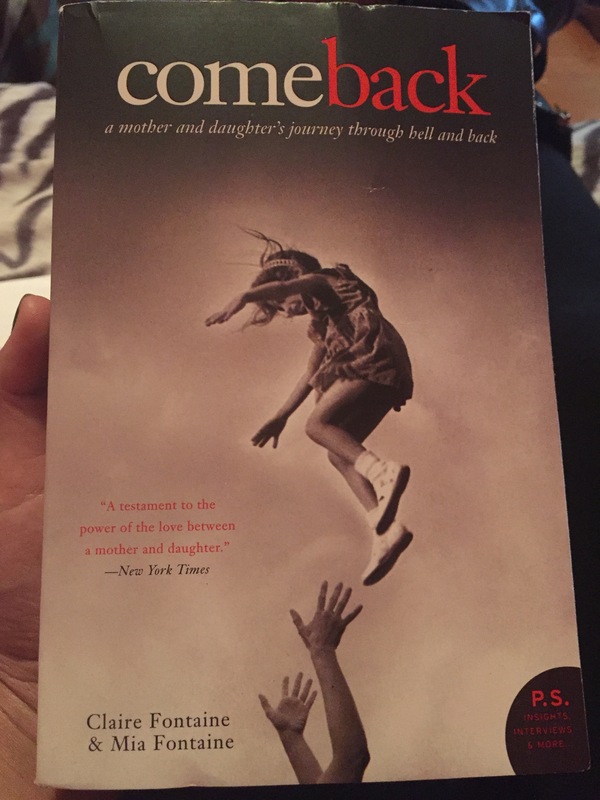 My book, Comeback, is about a girl who also moves away but by force and for a completely different reason. She is being sent to the Czech Republic for boot camp and she goes through big changes for the betterment of herself. The last book, Gabi, A Girl in Pieces, is about a girl who talks about her crazy, messed up, every day life and how she basically laughs about it. 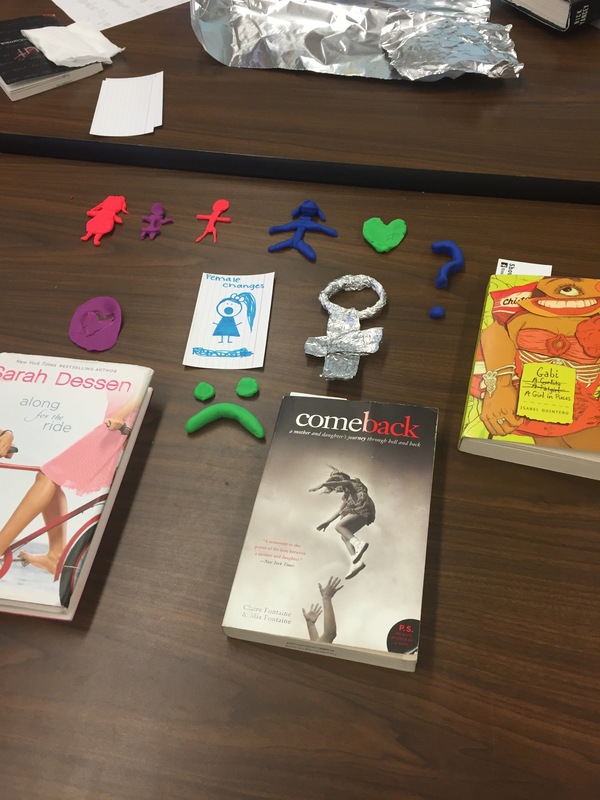 Our 9 items were a sad face, 2 play doh models of girls, a drawing of a girl, a heart, a foil female symbol, a broken heart, and a father. The girls in our books go through problems with their fathers, heart breaks, and dealing with basically being a girl. This is Mia, one of the main characters in my book “Comeback”. Basically, she is supposed to look like she is smoking because she is a drug addict. She thinks that it shows who she really is because it makes her feel better. As I looked for the next book I might read, I came across “Comeback”. I read the summary and was instantly hooked. This summer, my aunt got me hooked on James Patterson’s Alex Cross series books. Since then, my preference of books changed from teenage romance to anything tragic or mysterious. This book sounded to be just that. As I read the first pages, I couldn’t put it down. At the very beginning, it paints this pretty picture in your mind of how things used to be. Then, all of a sudden, it takes you about 11 years forward to a time where everything has completely changed. What really shocked me was how young Mia, one of the main characters, is and how she is already doing things I would never even think of doing. Also, since I have been seeing a lot of teenagers going missing or running away from their homes lately, I like that it is giving me more of an insight to what it’s like to be a runaway and what usually happens in those situations. I am extremely excited to find out what happens next. This last six weeks, we had to write an Op-Ed about anything in the world that we felt like we needed to spread our opinion out to a specific audience. We chose a specific topic and audience to reach out to. Then, we had to do some research and find 2 Op-Eds to write a rhetorical summary on. At the end, we went on to write our own Op-Ed following the outlines of Op-Eds we read. I chose to write about modern-day feminism with my targeted audience being “feminists”. I really wanted to write about this because it really bothers me to see that this is going on and the other side isn’t getting their opinion out. It was really hard for me to find an op-ed with a similar opinion. It wasn’t very hard for me to choose a topic because this has been on my mind lately and I see it almost every day on social media. 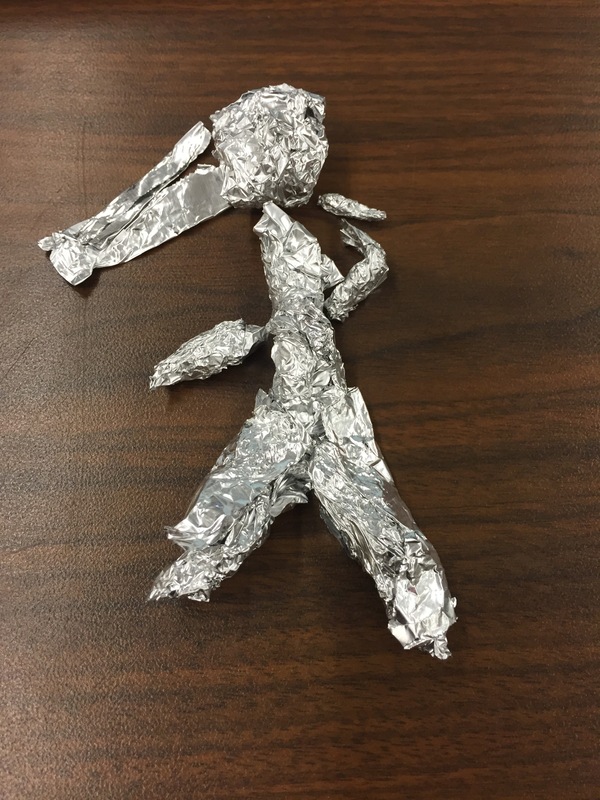 I got a couple of comments from students. 2 out of the 3 were from male viewers. As one of them said, “finally, someone with common sense”, I think they are relieved that there are women out there who are on their side about this. All three of the comments agreed with me. Thinking back on my argument in my op-ed, I probably should have added somewhere that not ALL feminists are this way. Also, I would have spent more time on the planning part and stayed on track so that I would have gotten a little more feedback. 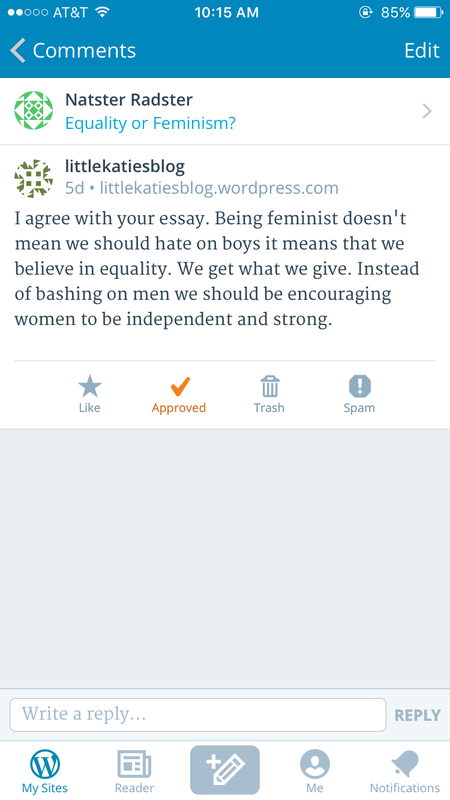 I learned that maybe a lot of women will not agree with my opinion but men most likely will. Also, that there are a lot of women who think that they are fighting for something that will further on help gain equality. 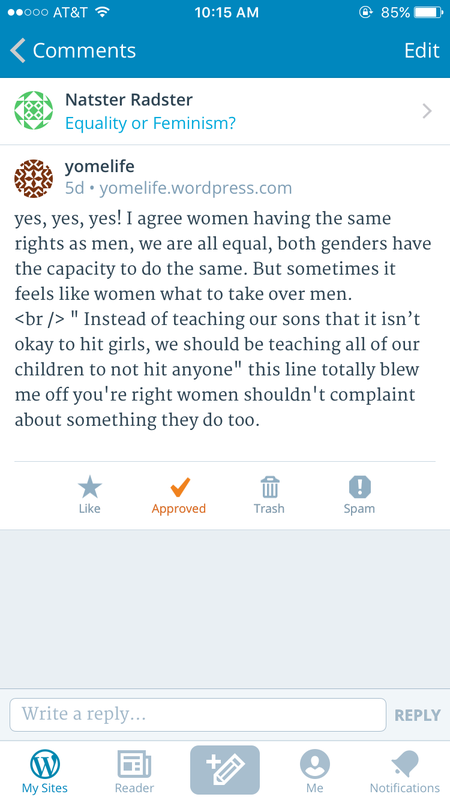 I respect their opinion because maybe we all have our own idea of what equality is. I just don’t believe that they should force it onto people, the same way they wouldn’t want someone doing to them. Therefore, I learned for myself that it is okay to go against the current and have your own personal beliefs.